The green area of Viale Regina Elena accessible every day. A stroll-garden, which starts from the lift that leads to the Bastion of Saint Remy to APCOA Parkings in Viale Regina Elena: a new space under the walls of Castello, abandoned for decades, closed to the public for a while because of restoration, and now returned to the city. The area, once occupied by the former municipal nursery, has been inaugurated Friday, 28 th March 2014 with a large influx of Public. The garden is about five hundred meters long, stretched for 6500 square meters. It is composed by two very suggestive routes on two height levels, linked together by a beautiful vaulted staircase, also restored, and soon they will be also connected by the intermediate stop of the lift, which will allow the intermediate access between the Terrace of Santa Caterina and Viale Regina. The "Fratelli Giuseppe e Vittorino Fiori" Garden has been embellished by the precious recovery work of the futuristic style of Ubaldo Badas, together with sculptures of the Sardinian artist Pinuccio Sciola. In the promenade, infact, the Hemicycle Theatre, designed by Ubaldo Badas, has been restored safeguarding the railing and the transformer kiosk. 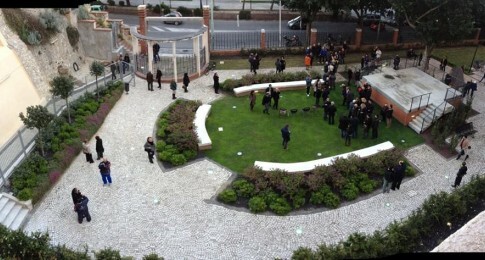 Seven works of Sciola have been installed: in front of the main entrance an architectural sculpture; in the proximity of the Open Theatre a modern basalt stele; on the lawns three stone seeds and some tied stones. Finally, in the marble basins, there are three installations in limestone: the first is inspired by the submerged city, in memory of the Holy Santa Igia on the shores of Santa Gilla, the second is a tribute to Castello, the perched city . Finally, in the third basin, the pyramidal sculptures recall the salt works, one of the characteristic traits of Cagliari: the city of salt. The massive restoration works have allowed to the "Fratelli Giuseppe e Vittorino Fiori" Garden to be fully wheelchair accessible and soon will be even inaugurated a dining area inside.